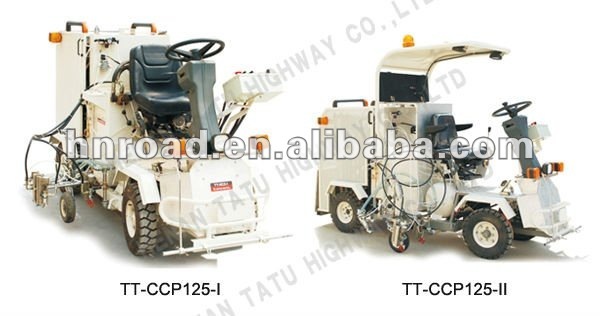 Custom and Cheap Driving Cold Paint Pavement Making Machine Supplier and Manufacturer.--Tatu Highway Group Co., Ltd.
Tatu Highway Group Co., Ltd. Custom and Cheap Road Making Machine,Road Making Paint,Intelligent Photoelectric,Pavement Machinery,Road Facility Supplier and Manufacturer. 1.Advanced hydraulic drive CVT system, adjust and control speed accurately. Driving optimal design can control the machine effectively and ensure safety in an emergency. 2. High capacity double room paint tank and glass bead tank can ensure long distance and continous road marking. 4. The width of road marking lien can be adjustable according to customer's request. 5. Automatic paint stiring system can ensure stir equably, and improve the performance of paint effectively, and improve the durability of road marking line. 6. long wheel tread can ensure road marking line more straight, and reduce the effect of human factors, and improve the quality of road marking line obviously. 7. Sensitive, precise and stable micro-electronic control system can be operated easily. 8. Double seats which can be chosen freely according to the driver's request. 9. All-around warning system ensure safety during construction. 10. Optional system include pre-marking, trailer, swing type, screeding type, and two component type. P air-cooled electrical starting gasoline engine. 2. Driving system: imported oil pressurized continuously variable speed transmission system (HTS) with automatic brake device that can freely go ahead, back off and stop. The left and right back wheels are equipped with a differential speed gearing to ensure it to drive freely around the curve and change directions timely. The hand brake system makes the driving more secure. 4. Maximum climbing capacity: 15°. 5. Micro-electronic control system: This system sets four marking modes (also can make personalized design according to the customer ’s standard). Spray gun controller can freely change the guns between the single and double spray guns. 6. Chassis: A firm welded frame; its surface has been chrome-plated or sprayed with corrosion resistance coating; equipped with imported high speed bearing which ensures the whole machine lighter and more convenient. 7. Rubber wheel: The left, right, front and back wheels are gas-filled pressure resistance vacuum ones whose diameters are 400mm. 8. Guide rod: Can be freely adjusted to up, down, left right. 9. Lighting and warning function: Equipped with highlight lights which makes the night working convenient. The warning lights whose flicker frequency can be freely adjusted greatly improve the safety of the marking work. 10. Paint pump: Equipped with single (type I) 20L/min or double (type II) 12.5L/min plunger type high pressure airless pumps with big flow and stable pressure. Maximum pressure is 20mpa(Working pressure 10-15mpa). 11. Paint tank: The capacity is 215 with a filter device in it. 12. Spray gun: Equipped with three new-type pneumatic spray guns and one hand spray gun with an lengthening pipe for spraying special signs like arrows and letters. The hard side columnar reverse washed nozzle (30/20) makes the on-spot discharging easy and convenient. The non-arc nozzle can enable the marking line straight and exact. 13. Available paint: Applying to spray cold solvent, water-based and two-component road marking paint. 15. Glass beads dispenser: Equipped with single pressurized 60L glass beads bin with a window. Single glass beads spraying gun can be equipped on the left or right that can freely adjust its pressure, flow rate and spray width to ensure the spraying glass beads firmer, evener and more economical. 16. Glass beads bin: The glass beads bin with a window to check the quantity of glass beads timely; the capacity is 100kg. 17. Pre-marking working synchronous with the marking operation, greatly improving the construction efficiency.